First things, first. Inspiration. I remember watching this video and feeling close to Yegge’s philosophy, and even though this may superficially feel unconnected to the topic it explains the main reason of why I got interested in bioinformatics. If you are computer scientists you need to bridge the biology gap. Note that buying a Biology textbook is helpful, but not necessarily the quickest way to get you there. The biology you’ll be dealing with is mostly molecular in nature (so that rules out anything you can see with your naked eye). The following are a few excellent articles “for computer scientists” and non-CS people alike. There are of course, more “specific” bioinformatics general-articles, e.g. Big Data, Cloud Computing (shameless plug) and Machine Learning, but I will leave these for some future post. There is a great set of lectures by Ben Langmead (Johns Hopkins University) from Coursera, titled “Algorithms for DNA Sequencing“. Last time I counted there were 55 videos (each of variable length, 5 to 10 mins max). During the summer months I organize sessions where we view a handful of these at a go, and I answer questions related to the material presented. I do this for fun, so holler (via comments below) if you are interested. Notice that this video lecture series is solely related to sequences. 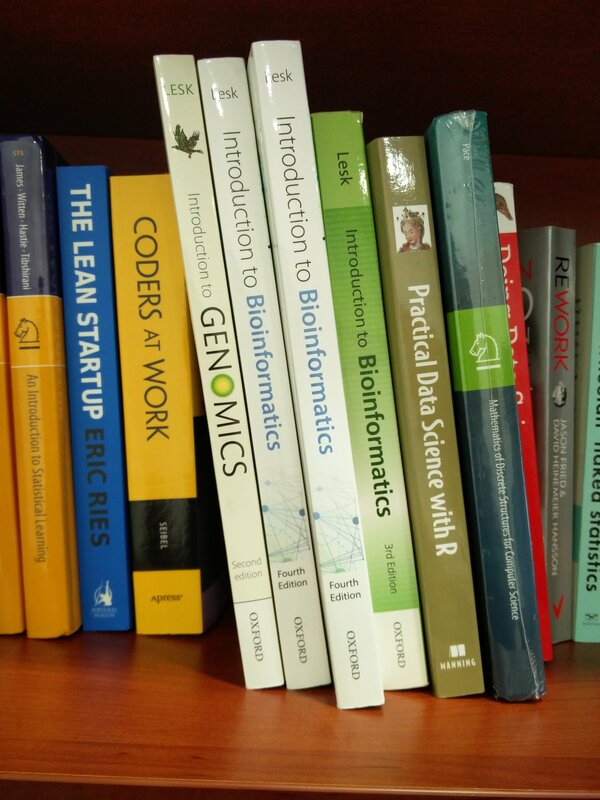 This section would not be complete without mentioning the bioinformatics specialization in Coursera. This is more general than Ben’s lectures, and it is also more involved with projects and deadlines. This is a bit too “cartoonish” for my taste, and perhaps aimed at a more playful audience. The good-ole coffee table balancer. If you are old school and prefer a book, may I suggest Lesk’s Introduction to Bioinformatics (4th ed. )- which is the book which got me rolling in the area many editions and moons ago. I always have a few copies in my office if you want to borrow one (mostly because these books are always on loan, and they are never sitting on the shelf). Get in touch via comments below. So now you have things to watch and read. In the next post of this series I will publish seminal bioinformatics papers, which cover most areas of this exciting field. Meanwhile, have some happy (Christmas) holidays! * This will change soon-ish, stay tuned.